You are entitled to complimentary Travel Accident Insurance cover, as well as compensation for inconvenience due to delayed or missed flights and luggage when your tickets are purchased with your Citi Life Credit Card. Get up to 5 supplementary cards for your family members. You don’t have to pay any additional fee and can choose the spending limit on each card. To get assistance with dinner reservations, airline or theater tickets, dinner reservations, flower deliveries without lifting a finger, please call toll free on 800 0441 3487 within the UAE or +971 4 361 1234 from outside the U.A.E. You should receive the voucher through courier within 10 working days. Transfer your CitiDollars to Jumeirah Sirius points for complimentary stays, dining or spa experiences at Jumeirah Hotel. You can transfer your CitiDollars to the Jumeirah Sirius recognition and rewards program and enjoy the very best experiences that Jumeirah Hotels, Resorts & Residences present across the world. Enjoy room nights stay for as low as 5,000 Jumeirah Sirius points per night or spend 1,500 Jumeirah Sirius points to get an AED 100 voucher, which can be used for dining or spa sessions. 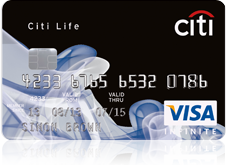 You can even use your CitiDollars to get an AMF reversal. You should receive the statement credit within 5 working days. You can only get an AMF reversal only up to the AMF amount that has been billed to you.